Learn how to quilt with old t-shirts with these free t-shirt quilt patterns and projects! Learn how to make a t-shirt quilt with one of the unique and budget-friendly quilting patterns in this brand new eBook, How to Make a T-Shirt Quilt: 11 T-Shirt Quilts. The free t-shirt quilt patterns and t-shirt quilt projects provided in this collection show you how to recycle old tees to create a quilt, pillow, or bag that helps you transform old tees into new projects that you will actually use. T-shirt quilts are the ultimate trash to treasure story, creating jewels from your junk tees. 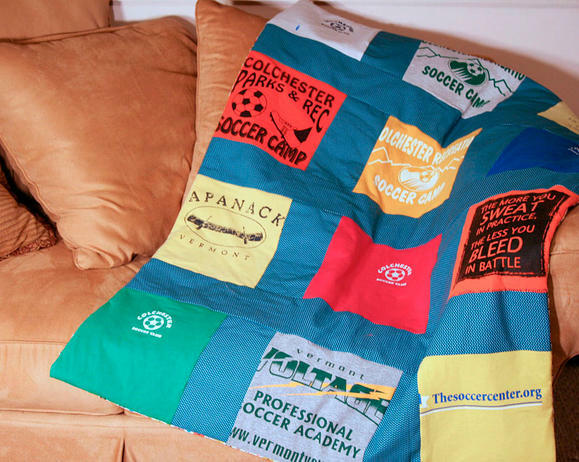 Quilters who are prone to bouts of nostalgia will love working with old college team shirts, vacation momentos, and more while they learn how to make a t-shirt quilt. There are free quilt patterns and projects for all skill levels in this fantastic and fun eBook. Everyone can find something to quilt! Download it today. Download your copy of How to Make a T-Shirt Quilt: 11 T-Shirt Quilts today. Sign Up for our Free Newsletter, Piecing it Together! We are so excited to introduce this free quilting eBook, How to Make a T-Shirt Quilt: 11 T-Shirt Quilts. Just about everyone has a ton of tees lining their closets or drawers that they never wear. Unlike other clothing items, it can be hard to toss t-shirts in the trash because they come with so many memories attached. Throwing away nostalgia is a total no-go when you are sentimental. This is where t-shirt quilts come in! Learning how to make a t-shirt quilt helps you cherish your memories while still creating a useful piece. T-shirt quilt patterns come in a variety of sizes and shapes. While they all might seem very similar, not all t-shirt quilt patterns work for your particular stash. That is why we have compiled this useful eBook that makes keepsake quilting incredibly easy. This quilt patterns eBook is filled with memory saving t-shirt quilt patterns. From traditional t-shirt quilts to t-shirt quilt bags and pillows, the quilt patterns in this eBook are sure to impress. Whether you are preserving your own memories or learning how to make a t-shirt quilt for a kiddo going off to college, you are sure to find the pattern that fits your particular need. More traditional patterns like the T-Shirt Memory Quilt (pg. 10) or the DIY T-Shirt Quilts for Hoarders (pg. 25) will help you create a comfy quilt that can double as a wall-hanging or be used as a bed comforter. If you don’t have a huge stash of tees at your disposal, smaller quilted projects like the T-Shirt Quilt Homemade Pillows (pg. 33) or the T-Shirt Quilt Pattern Tote (pg. 41) will do the trick. Download your own free copy of How to Make a T-Shirt Quilt: 11 T-Shirt Quilts today! When you think about learning how to make a t-shirt quilt, these are the projects that you probably pictures. This free quilting patterns eBook comes complete with traditional t-shirt quilt patterns that are sure to please. Created by piecing together quilt block squares from old tees in a variety of ways, these t-shirt quilts are perfect as bed quilts or wall-hangings. They make great DIY gifts for grads, as well! Classic Memories T-Shirt Quilt (pg. 8): This classic t-shirt quilt pattern is a cozy way to display old tees while still keeping a very clean and precise quilting design. If you are looking to add something to your home that looks a little less rustic, check out this how to make a t-shirt quilt design. T-Shirt Memory Quilt (pg. 10): This t-shirt quilt tutorial shows you how to make a t-shirt quilt that allows you to use tees of all different sizes to create a collage of designs. Instead of using all square blocks, this idea combines scrap tees with scrap fabric, making it one of the thriftiest t-shirt quilt pattern ideas you will find. T-shirt quilt projects are not limited to normal quilt patterns. You can create small quilted projects with your old tees, as well. These too charming ideas use quilting techniques like piecework and quilt blocks to display your old tees in brand new ways. Whether you are learning how to make a bag or creating a DIY pillow, these t-shirt quilt projects only use a few tees to make a big impact. Stadium T-Shirt Cushion (pg. 33): There is no better way to recycle your old team tees that to create this adorable homemade pillow patterns to carry with you to important games. Comfortable and portable, this t-shirt quilt project is as unexpected as it is clever. T-Shirt Quilt Pattern Tote (pg. 39): Carry your memories with you everyday when you use this free bag pattern to make a brand new t-shirt quilt tote. Transforming two tees into simple block patterns, this bag is surprisingly sturdy. If you enjoyed this eBook, you won't want to miss any of our other downloadable quilt patterns eBooks. You can browse our entire library of free eBooks here. If you are having trouble downloading our free eBooks, visit our FAQ page here: How to Download Our eBooks. The How to Make a T-Shirt Quilt: 11 T-Shirt Quilts eBook is absolutely free! If you decided that you love the eBook and would like more free quilt patterns and quilting tutorials, don't forget to sign up for our free e-mail newsletter "Piecing it Together" to become a part of our ever-growing quilting community. Weekly e-mails full of free quilt patterns, block patterns for quilting, and more! FREE new tutorials and quilt patterns made available to you throughout the year. Access to our free project library full of hundreds of free quilt patterns and tutorials. Throwing away old tees can be hard. It feels like you are just dropping memories in the trash. Learn how to preserve your old tees in brand new ways with this free eBook full of t-shirt quilt patterns and other t-shirt quilt projects. How to Make a T-Shirt Quilt: 11 T-Shirt Quilts is going to transform your junk tees into new treasures. I have so many old t-shirts that I refuse to throw out. Making a quilt from them is such a great idea. So glad I came across this offer for a free t-shirt quilt ebook. I'll try to download this tonight. I generally make t-shirt quilts with sashing inbetween but I'd like to try other variations of the standard quilt. Constructions methods can vary greatly and I love to learn new methods of making things. Thanks so much for the offer. thank you for the great ideas and pattens. Recently I tried to buy a log cabin quilt kit through your store but sadly you do not send to Australia. I was very disappointed but would still like to be able to get a copy of the pattern and instructions. Is this possible?? this must really be a great ebook - however all of the "pop-up ads" have driven me crazy and I have given up on looking at the instructions or even bothering to download it. MUST we ALL put up with the nonsense?? ?